Our monthly "Starry Beef Box" is a simple and convenient program to get the beef you need for your weekly meals for three months (perhaps beyond!). Each box includes 10lbs of a selection of beef cuts that we hand pick for your family for that specific month, as well as recipes to help you plan your meals, and a newsletter with "news from the farm", a little education on your beef cuts, and cooking and healthy tips! 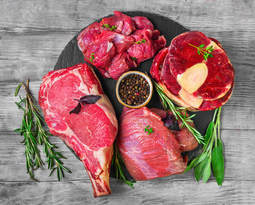 A sample beef box would include (approximately): 4lbs ground beef, 3lbs rib eye steaks, 2lbs chuck roast, 1lb stew meat. This is enough for at least 26 individual meals (at a 6oz portion size). At $150 a month, the price works out to less than $6.00/meal, and delivery is free! *Please keep in mind, as a small farm, a limited number of cattle means we can only accommodate a limited number of enrollments. * As a member, you will also have the option to expand to six months at a later date. It's easy! Go to the bottom of this page to make your payment. You will then get a confirmation email with your specific delivery dates for the 3 months. Your payment will be in full for the 3 months and no other charges should be expected. Also as a member, you’ll have access to special sales, a monthly newsletter and recipes included in your box, and an invitation to our annual "Customer Appreciation party" at the farm. Every month, on the specific date provided at the beginning of your enrollment, we will deliver your beef box straight to your doorsteps. You don’t need to be home, just leave a cooler in your doorstep or porch and your beef box will be waiting for you. Don’t have a cooler? No problem! We have foam-insulated boxes we can leave your beef box in so it remains frozen for hours. (We just kindly ask that you return it to us for next time!). Delivery boundaries are Chicago and southeast Wisconsin. The Beef Box consists of 10lbs of hand picked 100% grass fed beef delivered to your door monthly for 3 months. SOLD OUT for now, but contact us with inquiries.